Navy & White striped midi - Elianna Knit Dress - from CM. Viscose/Nylon/Elastine. Machine Washable. The structure up top. Fitted. Makes me look less narrow, and gives me some curve. The length and asymmetrical hem - elegant and swooshy. A-line - COMFY. I'm not into fitted sheaths hopefully ever again, and not into sack looks anymore either. This is what I want. The DOUBLE belt that is NOT attached to the dress so you can place it where you like. Genius. The stripes go in different directions. Cute. Looks great with simple flats. You have to be okay with showcasing the midsection and defining the waist in this dress. See pics. I just got these Naturalizer sandals in a 6.5 Narrow and they fit PERFECTLY. Very comfortable. I'm returning the Narrow Euro Bella Vitas because these are an even better fit, and more comfy too. The sandals aren't my first choice aesthetically, but I need to make the best of what I can find that work with my feet because I will NOT give up my active walking lifestyle. These look pretty enough to my eye - and I'm on Team Well Groomed Naked Nails. I'm MILIKNG the dress season because I've waited seven years for my lengths and silhouettes. Go Team DRESS! So cute! Must. Resist. I really don't need more dresses. Ooooh great dress!! 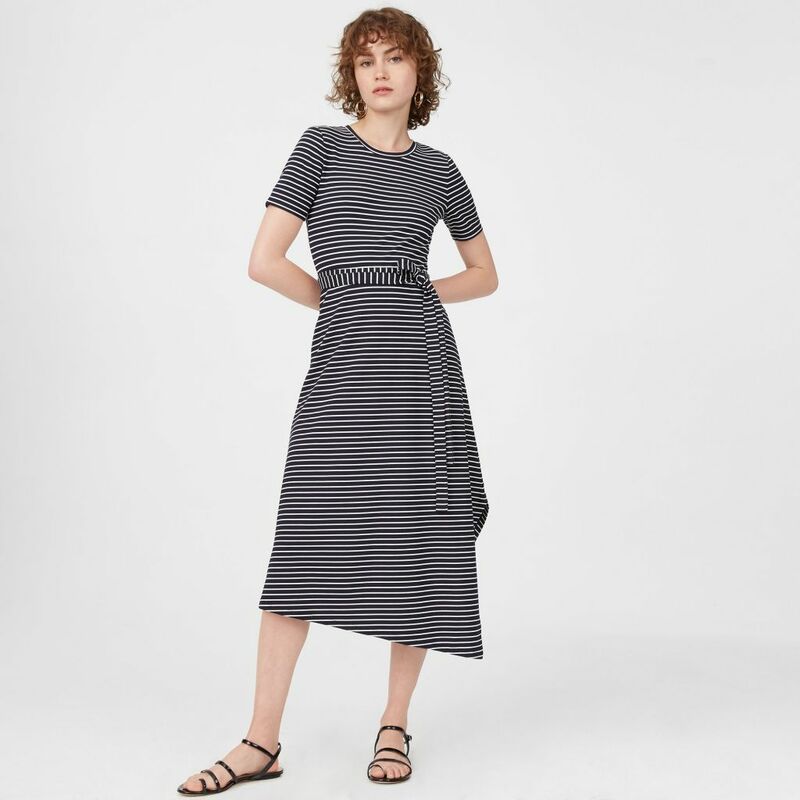 I bought a stripey dress already, even though I'm still a little off stripes, plus this would probably be too long on me *convinces self* or else I would be sorely tempted CLEVER belt. I like the sandals a lot but then they appeal to my bohemian side. Naturalizer for the win this season! Wow! Great dress..hard to resist, but I need to force myself to find some very casual summer skirts. Thanks, ladies. You make me laugh. Aida, I want to see your striped dress. This is my SECOND. One black and one navy. See Finds. Kathie, for me , this is a very casual dress. Looks great on you Angie! Navy stripes for the win! Killer gorgeous on you! And spring/summer 2018 has officially gone down in the books as the greatest dress season EVER. The dress and the shoes are perfect. You look fab! Laura, ABSOLUTLEY. 2018 goes down as the BEST dress season of all time. Oh wow, what a great dress. It looks fabulous on you. 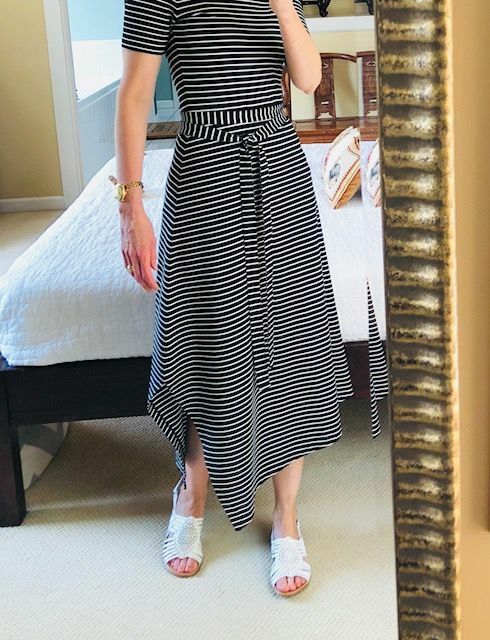 I’m 99% sure I’m keeping this navy and white striped dress. A bit more forgiving through the waist than the CM, yet still skims the body. That’s perfect on you! So happy you are finding dresses this season! I am too! You look absolutely gorgeous in this dress - although I was shocked to see you in sandals! 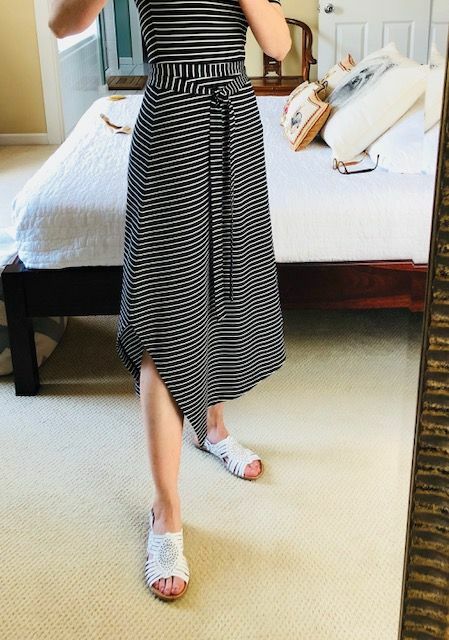 I love the length, the uneven hem and the fit. Stunning! 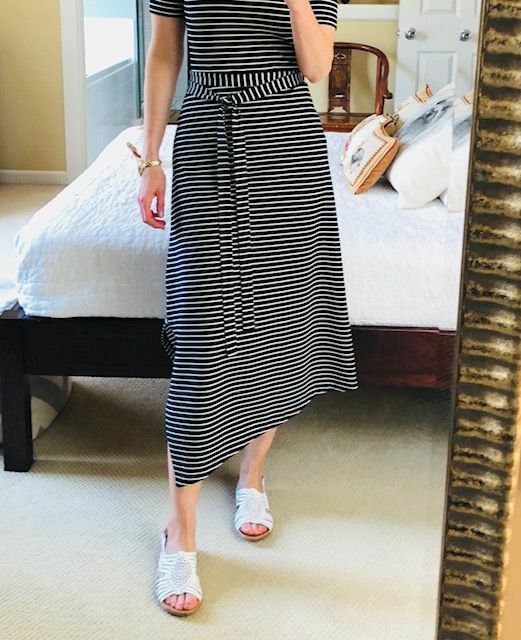 EDIT: I have a couple other striped dresses from before, too. 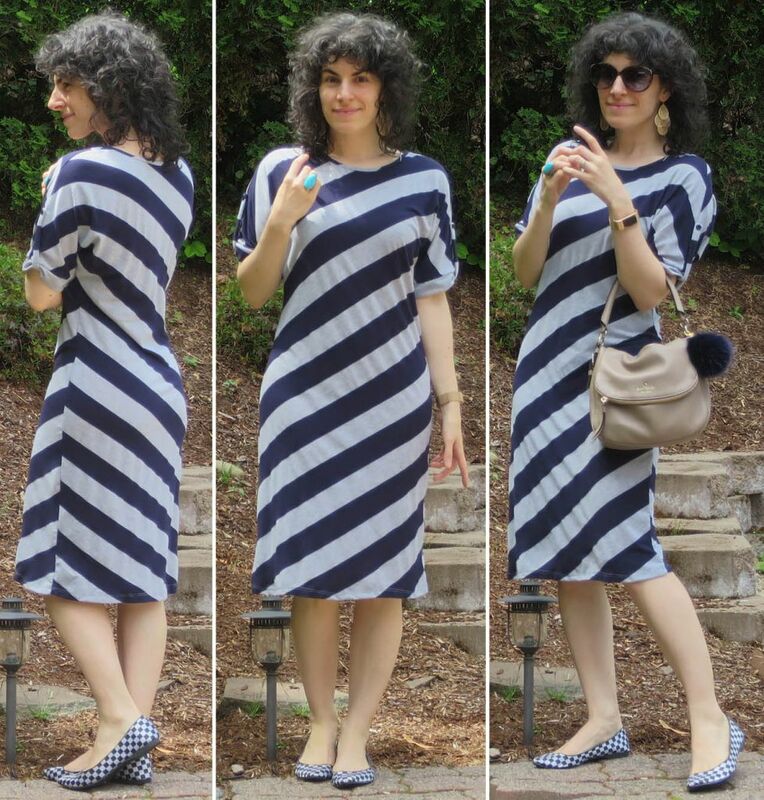 Definitely don't need another striped dress! Added my other two dress finds from this season below. Definitely DO need more color/print. Fun frocks, Aida. The second one is AMAZING on you. Nice, Elizabeth. Lets see it on. Jaime, I know. The sky is falling. I have ONE pair of sandals for the 100 degree heat in Salt Lake City and Italy. Boo. Sad about the Shellys! I have yet to pull mine out this season. All of my sandals (except the Shellys, actually) need replacing, no luck so far. Sandals are almost as hard as sneakers >< I'm glad you found this white pair! I'm curious though about your keeping just the one; don't wear sandals enough to keep both the Naturalizer and the BV? They are very different! Wow, that is fabulous on you! Gorgeous dress. Tempting!! I hear you on the footwear, too. It's all about finding the shoe that goes the distance, and that means slightly different things to each foot. Love this! It does have a hefty look and drapes very well. Nice score! Aida, I also have the mules so with one pair of sandals - I'm good for now. See finds. Suz, EXACTLY. You get it! Thank you. Navy stripes just for us. Sal, YES. That's what I have in mind. Gelato is the most important accessory. Beth Ann, thank you. Sending healing thoughts to both toes. You poor thing. It is a super dress and looks fantastic. 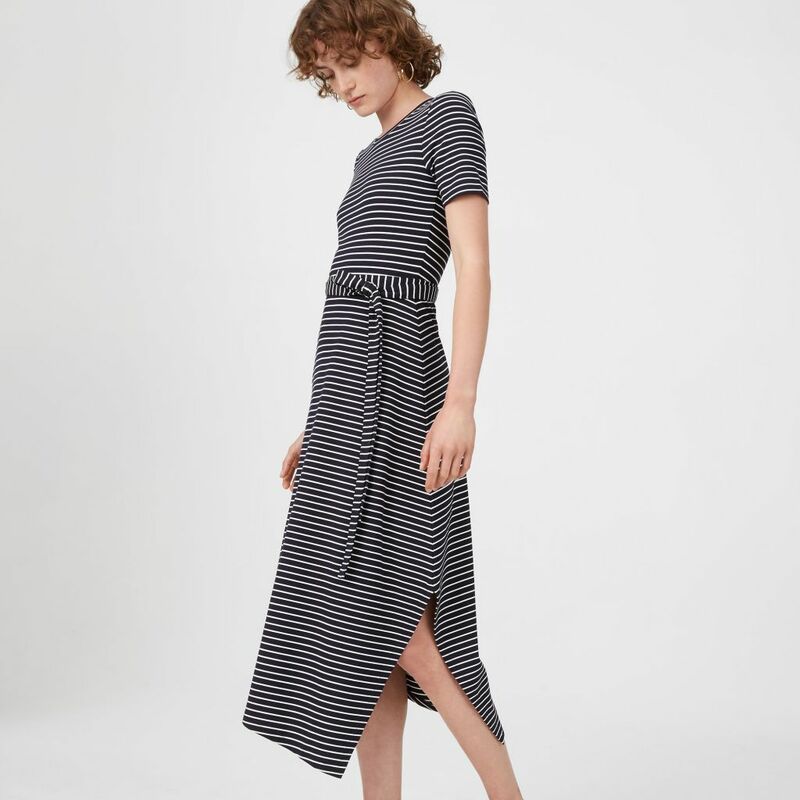 I’ve been looking for another casual summer item and was looking at stripes - I hadn’t got further than petite bateau and they were abit more casual than I’d prefer. I will make a trip to CM to see if they have one for me too! OMG, how lovely dress, I adore stripes. It looks perfect on you, great sandals, sweet Angie. You really make that lenghth work, even without heels, nice! Out of curiosity: why are you so very much over fitted sheaths? Love the dress. Looks very fab on you. Wish it came in another colour for me. I am not a navy person. I will have to look through CM a bit more. That is a great dress and it does look wonderful on you! 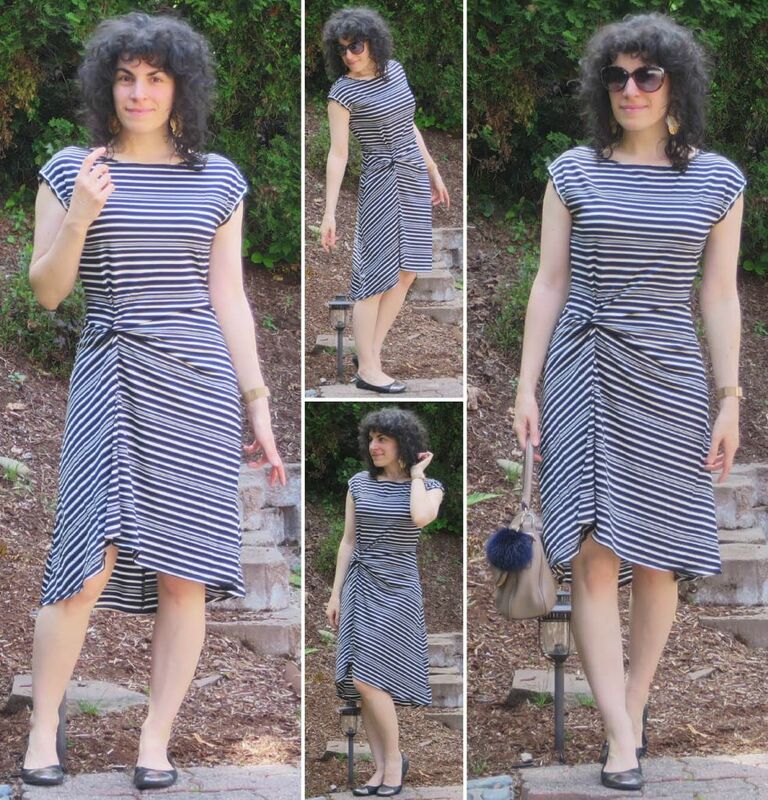 I reached my quota on navy stripes with my recent purchase of a Hately Elsie dress. I’ll be wearing mine with white sandals or silver flats. Long live navy and white stripes! What a perfect dress - made for you! Those sandals remind me of an iconic Mexican style called “huarache”. I’ve always loved them but haven’t had any for a long time. I’ll have to consider these white ones...naturalizer is such a great brand!